There have been more opinions expressed about the marriage of Prince Charles and Princess Diana than any other relationship in history. Many have taken one side or the other but few people would believe that it was a match made in heaven. From an astrological perspective this is not true, all matches are made in heaven, people come together because it is what is required at the time. The real point of Astrology is to help us come to understand the requirements of the time. This is particularly true in Synastry, which is the astrology of relationships. Comparing birthcharts can help us understand how the themes that one person has to explore in their life interact with those of another. Prince Charles has the Sun in Scorpio, a placing that would suggest an emotional and passionate man. His Sun ( in gold in the chart ) is in the 4th house at the bottom of the chart together with Mercury, Venus and Neptune. This combination shows someone with great depth of character but much of this would not be seen on the surface or recognised by everyone. The 4th house is the area of family and home the major theme of his life is his inheritance and the issues that arise from that. Looking at the chart it’s easy to get the impression that it is dominated by the Moon in Taurus at the top in the 10th house. The Moon in a chart has rulership over the relationship with the mother. It is at 0 degrees of Taurus, exactly the same degree as the Queen’s Sun, so there is no doubt who the Moon is referring to. Charles has a Leo Ascendant. In Astrology the Sun rules the individuality, the essence of the person, the Moon rules the emotional make up and responses and the Ascendant rules the way that they have to project themselves and appear to other people. With the Sun in Scorpio in the 4th, Charles is an essentially private person who has to appear ( Leo rising ) as the future king. Mercury ( in green ) in Scorpio in the 4th is in opposition ( blue line ) to the Moon and the tension created by these two pulling in opposite directions is projected onto the Leo Ascendant ( via the red lines ). That his life would be dominated by these issues is clearly shown in the chart. The 4th house also rules land and buildings. Scorpio, Taurus and Leo are all fixed signs. Fixed signs are concerned with maintaining and stabilising things so Charles’ passion for preserving traditional approaches to architecture and agriculture is indicated in his chart. Charles’ Sun is in square aspect ( red line ) to Pluto indicating a sudden and powerful change in his life that would have major consequences for both himself and his family. 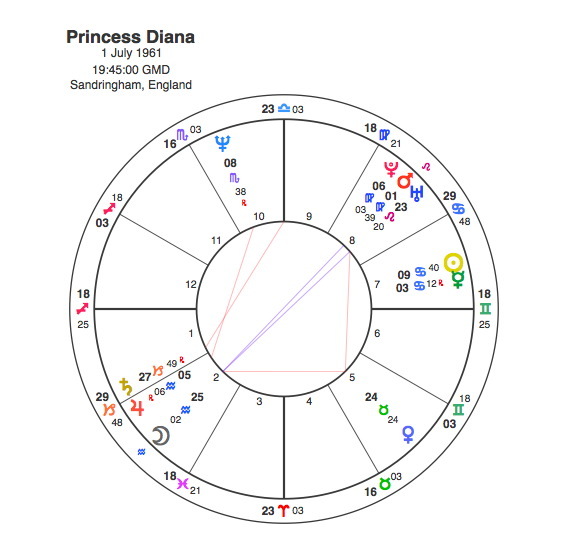 Princess Diana had the Sun in Cancer, another water sign indicating another sensitive and emotional individual. Her Sun was in the 7th house which is interesting as the Capricorn Astrology Research Project has shown that public figures are much less likely to have the Sun at this end of the chart yet here we have one of the biggest celebrities in history with this placing. In Diana’s case it does make sense as the 7th house is the house of marriage, and if she hadn’t married Charles most of us would never have heard of her. So issues within marriage were the essential ones for Diana much as those around inheritance were for Charles. Diana had the Moon in Aquarius which gave her the ability to relate to many different kinds of people from all walks of life which together with the natural Cancerian empathy gave her what many referred to as the “common touch”. Diana had a Tsquare with the Moon opposite Uranus ( via the blue line ) focusing all its energy onto a powerful Venus in Taurus. Uranus rules modern media and Venus is the principle of attraction, so with this aspect its no wonder that Diana was the most photographed woman in the world. To understand the themes in a relationship we have to look at the major planets in both charts and see how they fit with each other. Charles’ Sun at 22 degrees Scorpio is opposite Diana’s Venus at 24 Taurus, so the media forces at work in Diana’s life would be pulling him in the opposite direction that he would naturally go. His Sun also throws square aspects to Diana’s Moon / Uranus opposition. Diana would find fulfilling her needs ( Moon and Venus ) would take her in a different direction to Charles. 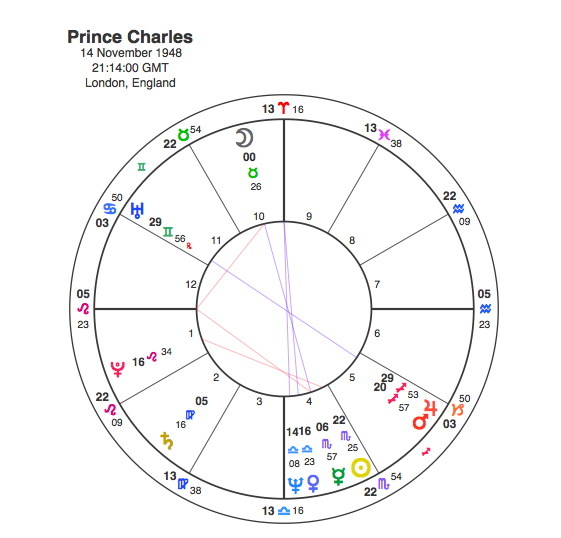 At some point in their lives these tensions would become too strong and the sudden, powerful change that is indicated in Charles’ birthchart would be inevitable. The watershed year for Charles and Diana was 1992, with the publication of Andrew Morton’s book and the announcement of their separation, a year that the Queen referred to as an ” annus horribilus “. Pluto moves very slowly by transit in an anticlockwise direction round the chart and it would only make one aspect to Charles’ Sun in his lifetime. In 1992, Pluto was at 22 – 25 degrees Scorpio in conjunction with Charles’ Sun, unleashing the powerful and sudden change referred to in his birthchart. At the same time Pluto was opposing Diana’s Venus and in square to her Moon / Uranus opposition, the only major aspect that it would make in her short life. That Charles and Diana were heading in different directions was inevitable given their charts, it was equally inevitable that this split would come to a head in 1992. It was a match both made and unmade in heaven.